Take note of these lit backyard wedding ideas as they will come in handy when planning yours; and they are very budget-friendly! These backyard wedding ideas will steal your heart. Simple, affordable and totally lit! 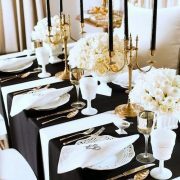 Move over huge bash, intimate receptions are the new trend in town. So, we bring you a ton of backyard wedding ideas that are fire! Most couples today prefer the intimacy of a small event with framily rather than shelling out their hard earned moolah on an impressive soiree to celebrate their union. And nothing says cozy and unique like your own backyard. Check out these Pinterest-worthy backyard wedding ideas and pick the ones that suit you the most! Or check out this guide if you need directions on how to plan a backyard wedding from scratch! A wonderful gift for those warmer ceremonies is to offer paper fans, tiny monogrammed bottles of water, or adorable parasails. Another divine idea to keep your guests comfortable, would be to offer some lemon eucalyptus oil bug spray. Add some natural pesticides to your decor like sprigs of rosemary, lavender, mint, and thyme. And don’t forget a few citronella candles or torches! 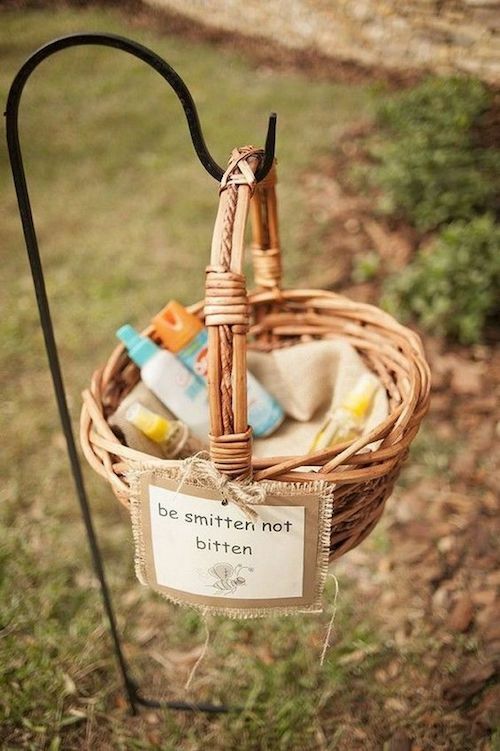 A simple hanging basket for your guests to help themselves to some bug spray. 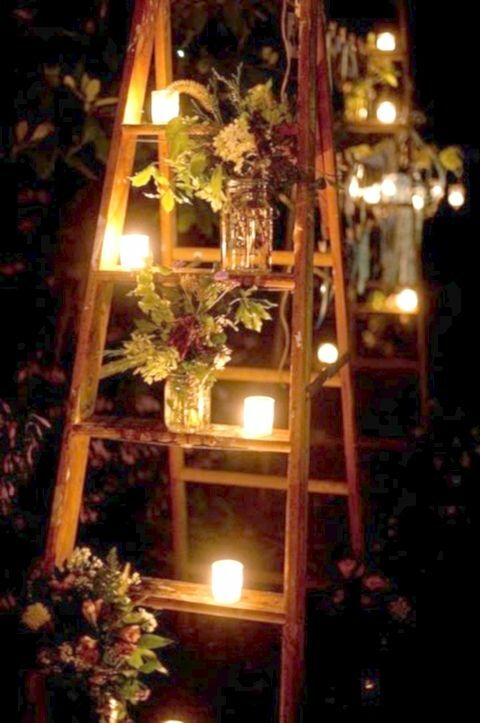 Achieve a rustic or vintage look with a ladder, votive candles and flowers in mason jars. Simple backyard wedding ideas. Naked and semi-naked cakes are TD and will be your best bet for a flawless backyard wedding. Less cooling and maintenance than their buttercream counterpart. Add a grazing food station to wow your guests. They feature a variety of cold cuts, breads, fruits and cheeses and are a pretty new addition to the wedding scene. As for your drinks: you can get creative with your cooling options. decorative flower pots with bags of ice are clever coolers; freeze fruits and berries in ice cubes and to make a fun chilled punch; for those ale and beer lovers grab an on-ice beer dispenser. Keep your guests cool with a help yourself lemonade stand or ice-cream bar. 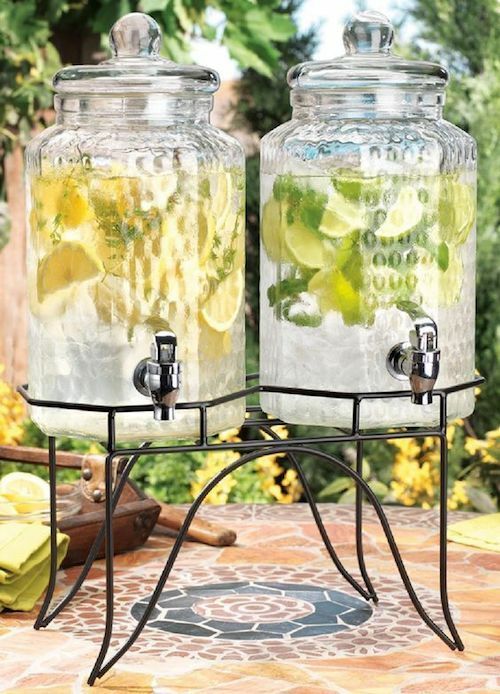 Delight your guests with lemonade served from twin juice dispensers! 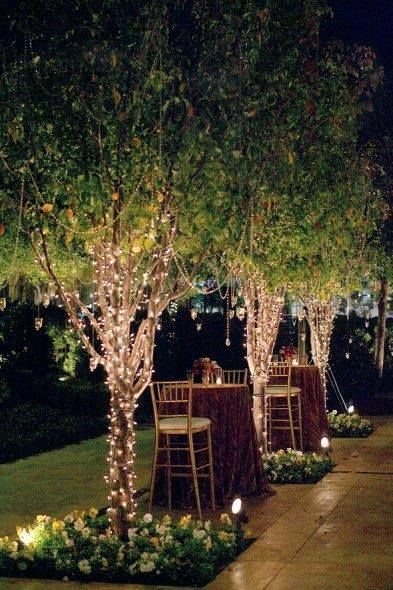 Wrap your trees in string lights and add a few tall tables. Downright fab. 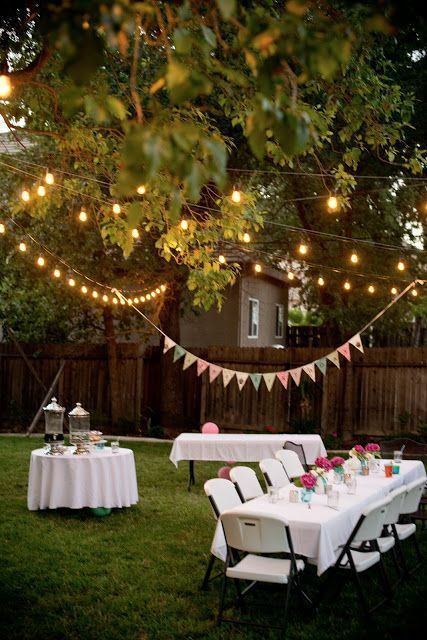 Create a canopy of string lights in the backyard. Affordable and TD! Backyard wedding ideas that are taking over hunty: turn a mirror into a welcome sign. Write on it and place it on an easel at your home’s entryway. For those holding their nuptials in the cooler months; think strategically placed heating lamps and warm, fuzzy flannel blankets as wedding favors; your guests will love you for those. A great give-away for the ladies a bucket filled with high heel protectors to prevent them from sinking into the grass or scuffing their shoes with rocks and all. And save on a dance floor! Add a cute little note to your blanket basket. 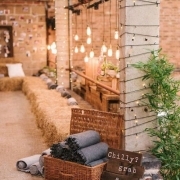 Check out these winter backyard wedding ideas. 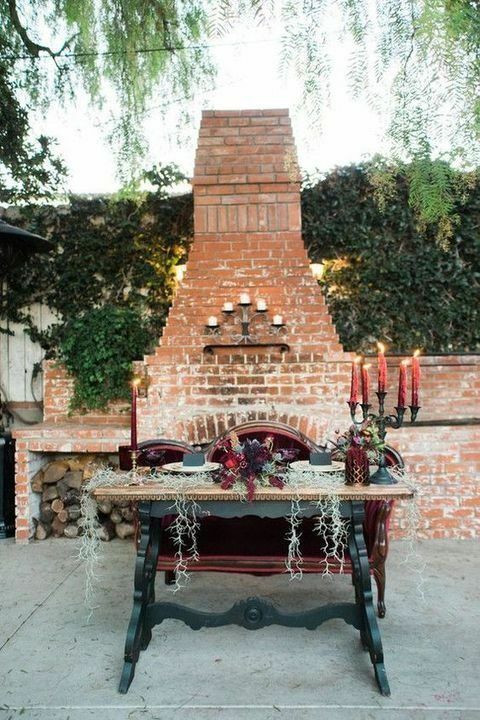 Fall backyard wedding ideas: Did anybody say glam Halloween? Try to embrace the natural setting. Giant floral wreaths made from silk or fresh flowers can add an air of romantic drama. Need a DIY? Check it out! A backyard hack that is definitely lit – pun intended – line your garden with rope lighting. Perfect for an evening bash and it’s waterproof! Creating giant elegant floral walls out of silk and paper flowers; serves as another way to separate space and can act as a photo backdrop. Two for one! 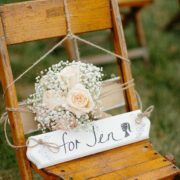 Yay for these boho chic mismatched chairs backyard wedding ideas. Photo: Elizabeth Wells Photography. 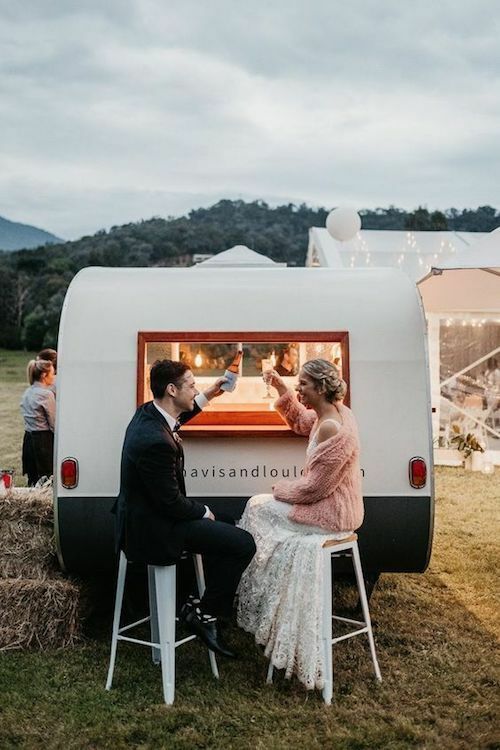 No need for a kitchen when you bring in the most adorable food truck! Photo: Daniel Milligan Photography. If your arrangements are in need of some living up, try adding some moody colors as they looks amazing with almost any floral choice. From Photo Booth decor to reception tables; moody colors are taking over hunty. 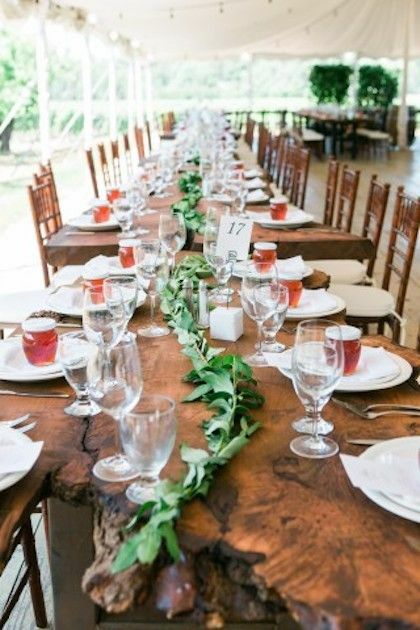 Weaving greenery across the back of the ceremony chair or along the table and placing small flowers along the will make a great statement. Remember paper and silk doesn’t mean cheap. It’s practical and with the right touch can have your entire ceremony lit. Being diligent can save your budget. 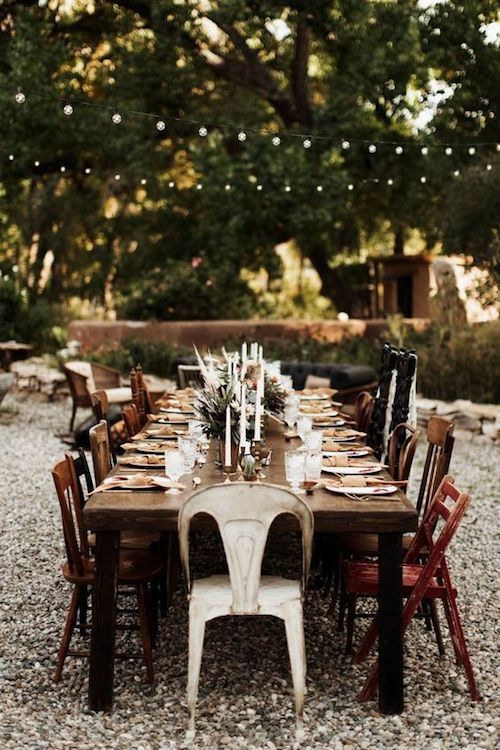 Folding tables and chairs, string lights and buntings for a very festive wedding in your own backyard. 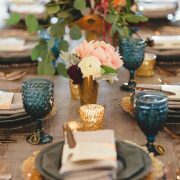 So, toss out the notion, that to plan a backyard wedding on a budget is all shabby with very little chic and tell us which one of these backyard wedding ideas did you like best? Photography credits: deerpearlflowers, happywedd, weddingomania, ruffledblog, planyourperfectwedding, bridalguide. Cómo Elegir la Combinación Perfecta de Sabores de Torta para Bodas Cake Ideas for Intimate Destination Weddings That Are Fire!